Dental implants are titanium tooth root substitutes. They replace the root portion of a natural tooth, the part of the tooth under the gum that anchors the tooth to the jawbone. Titanium is the metal used by orthopedic surgeons for artificial joints. When you lose a tooth, you lose both the root and the visible portion used for chewing. 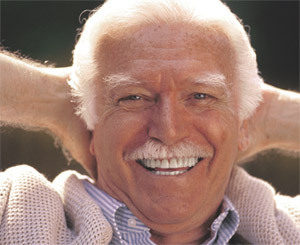 The dental implant replaces the root, and the visible portion is replaced by a dental crown that fits onto the implant. Dental crowns can be either cemented, or screwed, onto an implant. Which method is best depends upon the angle at which the implant is placed into the bone, how many teeth are being replaced, and other factors. A major advantage of screw-retained dental crowns is that they can be removed by the dentist if ever necessary. This is quite unlike a dental crown cemented to a natural tooth or implant. As a prosthodontic practice, we are very familiar with these two methods, and have the experience to select the best method for a given situation. Implant surgery can take place in one or two steps, depending upon conditions in the mouth. Sometimes the surgeon leaves the implant under the gum when it is first placed, and then uncovers it in a second procedure. At other times, the implant remains exposed after placement. An implant can be placed into the jawbone at the same appointment that the tooth extraction is done. Or, the tooth may be removed first, and the implant placed after new bone fills the tooth socket. The best approach depends upon your oral condition.